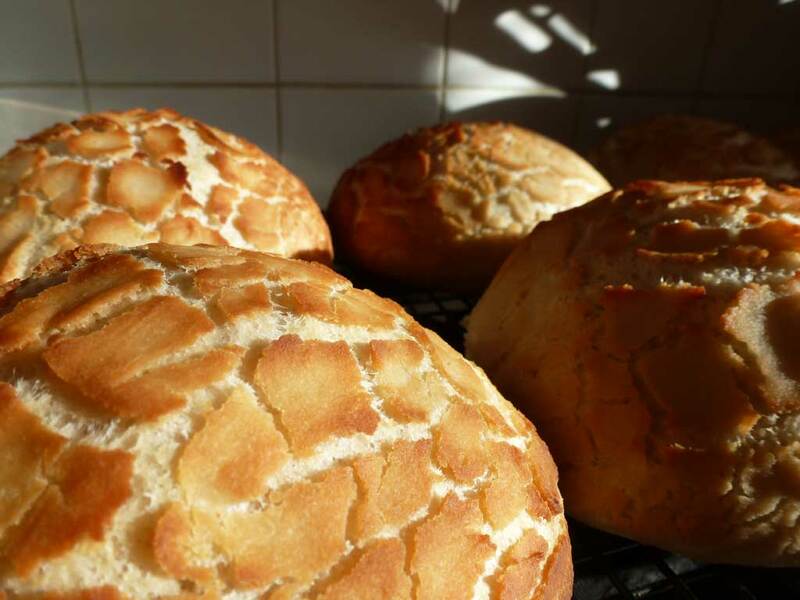 I adore Tiger Bread. I have been known on occasion to go to the supermarket, buy a loaf of it, peel off the crust and stuff my face (whilst sitting in the car in the car park) and then bring the rest home and use it to make breadcrumbs. This is, a rare occurrence. Partly because I would prefer it to be slathered in butter first. And only when I've for some reason not eaten for hours on end. Honest guv! My mum always used to have it when I went to stay with her until I got her back into baking her own bread when Miss A was first weaned. And then, when we visited, it was just boring old home baked white or granary. Nice as it is, everyone needs a little 'GROWL' in their life every now and again. Last time I visited, Mum had made her own Tiger Bread. It tasted right, but wasn't scaly like you get from the supermarket. She said she'd had a trial run the previous weekend and it had worked well but for some reason, this particular one didn't crack properly. The recipe had come from the interweb but I forgot to ask where from. All I knew was that you mixed a paste, brushed it on top of the proved loaf and then baked as normal. 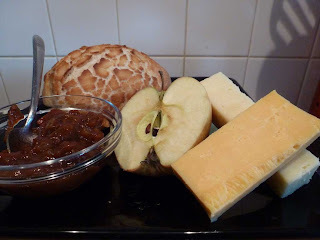 So, the other day I was idly blog-hopping and happened across a post by Mary-Anne Boermans from the Great British Bake Off. I follow all three of the finalists from the last series on Twitter (@wotchers, @joannewheatley and @hollybellmummy) and they're all really lovely ladies and full of advice. The list of recipes I want to try from them would probably keep me busy for the rest of this blog-run. It seemed like the perfect thing to go with the Chilli Jam from yesterday. And a real treat with some nice strong Cheddar after the seven-mile hilly run I had planned for this morning. Trouble is as I write, having consumed one already, the rest are busy taunting me from the kitchen and whispering how lovely they'd be with a huge pile of crispy-edged smoked bacon, lashings of butter and a good dollop of the Chilli Jam. Divine! The recipe is a doddle. It's just a basic white bread recipe with the special topping which is a combination of yeast, oil, sugar, salt, water and rice flour (this is important - don't use ground rice; although I've also seen a recipe that uses cornflour). Boermans helpfully tells you the consistency that you're looking for with the topping. Using the ratio she used, mine seemed too doughy so I thinned it down with some more water. I also found that I had too much and could've gotten away with half the amount. Whilst they were baking, I was a little worried that the crackle effect wouldn't work but they came out perfectly. I had intended to make a loaf, but figured that I'd get more crust for my bread if I went with rolls. It also meant that they were nicely portioned and I wouldn't just cutting off slice after slice as I would with a normal loaf. Or rather picking off the outside and leaving the middle. Lunch! A very posh ploughmans. The finished result was so good that the husband wouldn't believe I'd not nipped out to the shop and bought them (he was only convinced when he twigged Miss A was still in her pyjamas). One thing that was lacking though was the taste that the shop-bought Tiger Loaf has. There's something unique about that flavour that I always associate with Tiger Bread. My mum's bread had that flavour so when I eventually got round to speaking to her about it, she informed me that her recipe used toasted sesame oil in the topping whereas the Boermans recipe doesn't specify what kind of oil to use. With that knowledge, I could see how it would change the taste and I'd probably take that option next time. All in all, a bit of fun and something I would definitely do again in the future if I wanted to show off if I had guests or when we provide lunch to clients at the photography studio; not something for every weekend although the husband thoroughly approved of them so I have a feeling I'll be making them again soon. The recipe can be found on Mary-Anne's blog which is worth a visit for all the other lovely things she bakes. My adaptation is below. PS: Don't be fooled by the perspective in the picture of my lunch. The rolls are HUGE! Mix the flour, yeast, sugar and salt in a large bowl. Make a well in the centre and pour in the water and oil. Combine to make a smooth dough then turn out onto a lightly floured board, lightly oil your hands and knead for 10 minutes. Alternatively, you can use a stand mixer with a dough hook and knead the dough with this for five minutes. Leave the bread to rise for an hour. In the meantime, mix the ingredients for the topping. Soft baking brush – silicon for preference. Whisk all ingredients together in a small bowl. Cover and leave to rise. When the dough is ready, tip it onto a floured surface and gently pat down. Shape each piece into a roll and lay on baking sheets to rise. Best to use 2 sheets than try and squash all eight rolls onto one. After the rolls have been proving for 15-20 minutes, stir the paste vigorously and then brush lightly over the rolls. The paste will have the consistency of thick, pouring cream. NB Be careful you don’t deflate the rolls as you brush the paste onto them. Also – the thicker the layer of paste, the larger the ‘scales’ on the finished bread. Leave the rolls to rise for a further 15-20 minutes.